Disability insurance carriers often challenge a diagnosis of rheumatoid arthritis. How Can Disability Insurance Attorneys Dell & Schaefer Assist You? 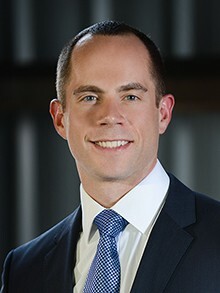 As disability attorneys, Dell & Schaefer have represented numerous long term disability claimants that have been unable to work as a result of rheumatoid arthritis. Disability Attorneys Dell & Schaefer have an expansive understanding of the significant restrictions and limitations that a person suffering with rheumatoid arthritis must live with on a daily basis. We have worked closely with top physicians in order to sufficiently satisfy a disability carrier’s threshold of evidence necessary to prove that a client is disabled by rheumatoid arthritis. Not everyone suffering from rheumatoid arthritis qualifies for long-term disability benefits, therefore the medical records of each client must be reviewed to determine the level of restrictions. We welcome the opportunity to discuss your long-term disability claim. You can contact us for a free consultation. Rheumatoid arthritis is a chronic inflammatory disorder that most typically affects the small joints in the hands and feet. Unlike the wear-and-tear damage of osteoarthritis, rheumatoid arthritis affects the lining of your joints, causing a painful swelling that can eventually result in bone erosion and joint deformity. For most people with RA the pain varies day to day, however it is continuous. Rheumatoid arthritis is an autoimmune disorder and occurs when your immune system mistakenly attacks your own body’s tissues. In addition to causing joint problems, rheumatoid arthritis can also affect your whole body with fevers and fatigue. Approximately 2.1 million people in the United States have rheumatoid arthritis and about 1-2 percent of the world population is affected by rheumatoid arthritis. Seventy-five percent of rheumatoid arthritis patients are women. Men, women, and even children can develop rheumatoid arthritis. Typically, disease onset for rheumatoid arthritis occurs between 30 and 60 years old. Rheumatoid arthritis occurs when your immune system attacks the synovium, which is the lining of the membranes that surround your joints. 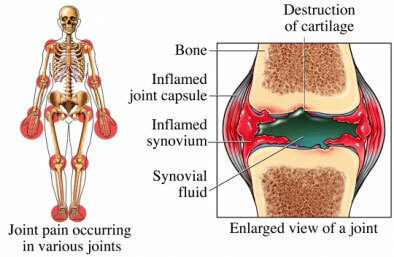 The resulting inflammation thickens the synovium, which can eventually invade and destroy the cartilage and bone within the joint. The tendons and ligaments that hold the joint together weaken and stretch, gradually, the joint loses its shape and alignment completely. Doctors cannot pinpoint a single cause of the rheumatoid arthritis, although a genetic component appears likely. While your genes don’t actually cause rheumatoid arthritis, they can make you more vulnerable to environmental factors, such as infection with certain viruses and bacteria, which may trigger the disease. Additional Factors that may increase your risk of rheumatoid arthritis include gender, as women are more likely to develop rheumatoid arthritis than men are. Age is a factor even though rheumatoid arthritis can occur at any age, it most commonly begins between the ages of 40 and 60. Smoking cigarettes increases your risk of rheumatoid arthritis. 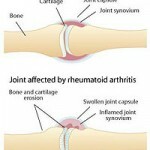 Rheumatoid arthritis causes joint damage that can be both debilitating and disfiguring. Damage to your joints may make it difficult or impossible to go about your daily activities. You may find at first that tasks take more energy to accomplish. With time you may find you are no longer able to do them at all. Signs and symptoms of rheumatoid arthritis may include joint pain, joint swelling, tenderness, swelling, rheumatoid nodules (firm bumps of tissue under the skin), stiffness, fever and weight loss. Early rheumatoid arthritis tends to affect your smaller joints first, such as the joints in your wrists, hands, ankles and feet. As the disease progresses, your shoulders, elbows, knees, hips, jaw and neck also can become involved. In most cases, symptoms occur symmetrically, in the same joints on both sides of your body. Rheumatoid arthritis signs and symptoms may vary in severity. Periods of increased disease activity, called flare-ups, alternate with periods of relative remission, during which the swelling, pain, difficulty sleeping and weakness fade or disappear. There is no cure for rheumatoid arthritis. Medications can reduce inflammation in your joints in order to relieve pain and prevent or slow joint damage. If your joints are severely damaged by rheumatoid arthritis, surgery may be necessary. Nonsteroidal anti-inflammatory drugs (NSAIDs) can relieve pain and reduce inflammation. Over-the-counter NSAIDs include ibuprofenand naproxen sodium. Corticosteroid medications, such as prednisone and methylprednisolone, reduce inflammation and pain and slow joint damage. Doctors often prescribe a corticosteroid to relieve acute symptoms. Disease-modifying antirheumatic drugs (DMARDs) can slow the progression of rheumatoid arthritis and save the joints and other tissues from permanent damage. Commonly prescribed DMARDs include methotrexate, leflunomide, hydroxychloroquine, sulfasalazine and minocycline. Immunosuppressants act to tame your immune system, which is out of control in rheumatoid arthritis. Examples include azathioprine, cyclosporine and cyclophosphamide. Tumor necrosis factor-alpha (TNF-alpha) inhibitors, is an inflammatory substance produced by your body. TNF-alpha inhibitors can help reduce pain, morning stiffness, and tender or swollen joints. Examples include etanercept, infliximab and adalimumab. Several other rheumatoid arthritis drugs target a variety of inflammatory substances produced by your body. These drugs include anakinra, abatacep and rituximab. During a total joint replacement surgery (arthoplasty), your surgeon removes the damaged parts of your joint and inserts a prosthesis made of metal and plastic. Inflammation and joint damage may cause tendons around your joint to loosen or rupture. A tendon repair surgery may be able to repair the tendons around your joint. If the lining around your joint (synovium) is inflamed and causing pain, your surgeon may recommend a snovectomy, removing the lining of the joint. Joint fusion surgery (arthrodesis) may be recommended to stabilize or realign a joint and for pain relief when a joint replacement isn’t an option. Through education about the disease, exercise, diet changes, assistive devices, and other supports many people are able to manage their disease. Fantastic article, please if I may ask a question. My wife is a confirmed patient for psoriasis arthritis diagnosed by a rheumatologist. We have cover for RA on our insurance policy under dreaded disease. Does psoriasis arthrites is also covered? As long as there are no concerns for pre-existing conditions, then the policy should cover for psoriatic arthritis. Can you file a claim for disability if you have been laid off? You can attempt to file a claim but you will most likely have a problem as it relates to coverage under the policy. Typically, if you are laid off you lose all benefits. If a claim for disability was not submitted under the insurance policy prior to being laid off it is arguable that you are not covered under the policy. I’m currently seeking a disability claim. I have degenerative disc disease same as my mother. Recently strained my groin muscle then found that have arthritis in my inner and outer hip. I have had 3 shots in elbows, 18 shots in my back. Do I have a claim? Gary, is your claim for benefits under a private disability insurance policy or through the SSA? If it is the latter you will need to consult with a SSDI attorney to determine the viability of a claim. If it is under a private disability policy please feel free to contact our office to discuss. Hi. I have been diagnosed with RA…. Will I be able to claim from Liberty Life? Meg, if you cannot work on account of your RA and your doctor supports your disability then you can certainly file for disability. That being said there are a multitude of other factors that can come into play. Please feel free to contact our office to discuss your situation further. Polly, if you are eligible to receive the increase it may be a wise decision in the event your conditions do prevent you from working in the future. I would discuss your claim with HR or if they have provided you an agent contact for Northwestern Mutual contact him or her to discuss your options in increasing benefits. We have published 37 articles about Rheumatoid Arthritisdisability cases. Here are the most recent ones.